The choice of Mat is one of the burning questions, which sooner or later faces every yoga practitioner. And it happens for a reason. From a psychological point of view, acquiring a personal carpet is a kind of expression of intention to the Universe to introduce yoga into your life not just as a "random passerby", and as "faithful companion" for each day. Even the ancient yogis, in spite of the ascetic way of life, was the tiger's coat, on which they meditated and went into deep Samadhi. Now the tiger skins are not in Vogue, but they've been replaced by a huge variety of carpets on the market of yoga goods. No wonder that in such an abundance of models, brands and materials people have recently appeared on the subject of yoga can easily get lost. 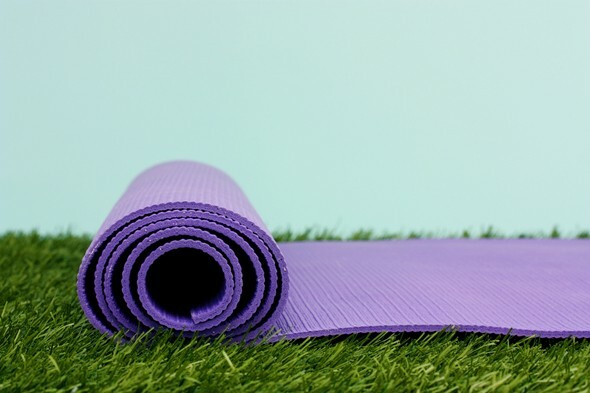 If the issue of purchase of a yoga Mat became urgent for you, pay attention to key selection criteria that need to be considered. The length you need to choose depending on growth, with a small margin (about 20 cm). If your height is 160 cm, length 180 cm rug will suffice. The stock in the length of the necessary in cases when in practice there are limits of traction (e.g. twines), to keep feet from slipping on the floor. People of large stature or full you can take the rug wider. Consider also that if you plan to take a yoga Mat with you on trips, then collapsed roll of carpet width of 60 cm to fit in a Luggage (suitcase) will be much easier. If your growth is highly not fit into these standards, and in this case there is a solution: some brands of rugs sold the cutting blade. In this case of a large roll you will cut exactly the length you need. One of the most important parameters of the carpet for yoga is its quality of adhesion. That is why immediately disappear travel mats-foam and the majority of sports mats. The bottom layer of the Mat has to kind of “stick” to the floor. This is important in order to prevent slipping of the Mat during training. The upper coating likewise should like to “keep” yoga that almost gives the ability to perform challenging exercises without too much slip on the Mat. This will provide you with a safe execution of the postures on balance and asanas with an intense tension and stretching. The product description on the website of the online store is not always possible to obtain real information on this. To ensure that the surface of the carpet do not slip, it is best to try it out. Fortunately, now almost every yoga center has a shop with relevant products, where the mats can be taken on trial" at the lesson, and if it met expectations, buy. The weight of the carpet can be from 900 to 3300 g. If you purchase the carpet for in-patient practices at home, and don't plan to take it with you on trips, then this parameter does not play a role. However, if you plan to take your yoga Mat to the gym or travelling issue-related seminars, it is better to choose one that is easier. Here again have the value of your personal dimensions. If the carpet chooses a fragile girl, then see options up to 1500 If the carpet chooses a man, the more range, it all depends on personal preference. This parameter can also be important when you travel, where there is a limit to the weight of Luggage. Carpet thickness can be from 3 to 6 mm. the thicker the carpet the softer the surface and the more comfortable it is to do asanas, where the emphasis is on the joints (knees, elbows, etc. ), which in yoga very much. Beginners usually prefer the thicker carpets. It is also important to remember that the thicker the carpet, the harder it is. Therefore, it is often necessary to compromise and seek a middle ground. Practice with years of experience and good training, as a rule, choose thin carpet. The strength of the carpet has value when your practice has become a regular and quite intense. The most durable carpets reinforced. However, they are also the most difficult. Check the carpet on the strength of the store is not easy, because real evaluation time is necessary. Therefore, there are only two options: to believe the description of the product and/or sales assistant or to consult with experienced yogis who on carpets is not one of the "dog ate it". Choosing the material, it is important to consider the specifics of your practice. If you exercise in a relaxing manner, and you don't have much to sweat, it will fit any model up to the cheapest. But if you are engaged intensively, in this case will not fit yoga mats made of PVC (PVC) closed at times, i.e. most of the budget options, "go to the forest". Your choice of carpet mats PVC with open time, the carpet with the technology PER+Jute, mats, cork floors, rubber mats. 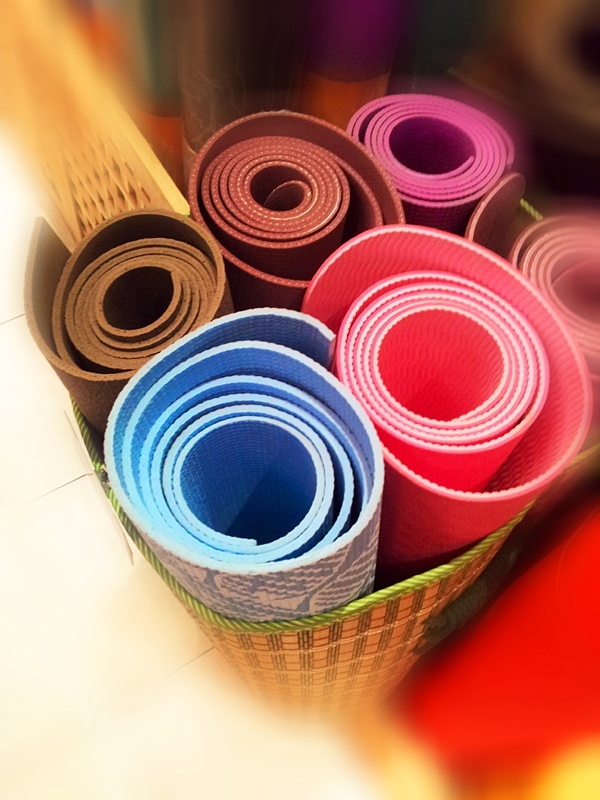 Now on the market represented a lot of yoga mats made of rubber and natural fibers. Here it is also worth noting that some materials have a rather strong odor, which has long weathered. So if you have a hypersensitivity to smells, it makes sense when buying a carpet as it should for him to sniff. Currently on the market of products for the yoga range of carpets is large enough. The prices are very different – on any budget. Here, as a rule, again we have to compromise between cost and performance to these parameters. It is clear that the higher the price, the greater the likelihood that the carpet will certainly meet your expectations. However, my experience is that "Golden mean" is right in the middle of the price range presented on the market. Yoga mats at a price above the average is usually instances have an additional parameter – the environmental friendliness of the material. Here is a solution for you – are you ready for the moment to pay for this option or not. There are also options such as color and brand of the manufacturer, but they pertain to individual preferences, so here you are "the boss". In conclusion, I would like to add that if you are going to buy your first pad, it is better to do it through the online store and at the point of sale, where you will have real opportunity to test, touch, try on their "buying". Or, if you don't want to take him home from the store, in any case, wait till you see the carpet "live", and then order it delivered to your house. Thus, you will get a better idea about the qualities of the goods. And, if all parameters satisfy you, take it! However, remember that the Mat does not make you a practicing yogi. This is only the first small step in a huge boundless world. Then everything will depend on you, your intention, and perseverance in practice. The Internet is full of instructional videos on exercises you can do yourself at home. Need to conduct training to strengthen the abdominal muscles, buttocks and thighs. They can be made at any time, and most importantly - the consequences can be comparable to those achieved when training in the fitness club. If you are followers of yoga to be very thin mats with a thickness of typically up to 6 mm and with a non-slip surface. Stability and contact with the floor, actually the most important factors during your yoga practice. More expensive models have a beautiful and original color or have a surface which prevents excessive sweating, and thus the exercises are more comfortable. Pilates strengthens the body, stretches muscles, and promotes rehabilitation. Exercises are performed primarily in the supine position, and therefore, any Mat plays a huge role. Mats for Pilates differ from yoga mats in the first place, the thickness - their thickness is about 1.5 cm, that allows to provide continuous protection from possible back pain. Their colors and functionality are impressive. Mats brand FlexMat have reinforced edges and handle for carrying. Mats for fitness are the most flexible type of Mat. You can do squats, support, stretching exercises. When buying a rug you need to think about bag which will help you keep it clean and for easy transport. What you need to pay attention to when buying? In addition to the mats, fitted to the appropriate exercises, an important element is its length, which must be adapted to growth. You should also pay attention to slip, material and flexibility - the movement of the mats during exercise is problematic. Ideally, an appropriate Mat can facilitate the performance of specific physical exercises and make learning more comfortable and the effects are more noticeable.